Hire the right person for the right job, coach people to prosper, create more productive teams and develop and lead your company through changes with the right workforce in place. We will provide you with the assessment toolbox, knowledge and skillset to start your journey for better business results. WHAT IS THE PREDICTIVE INDEX®? The Predictive Index leverages a simple methodology that empowers you to understand the true behaviors and cognitive ability of your workforce so they can take you where you want to go. 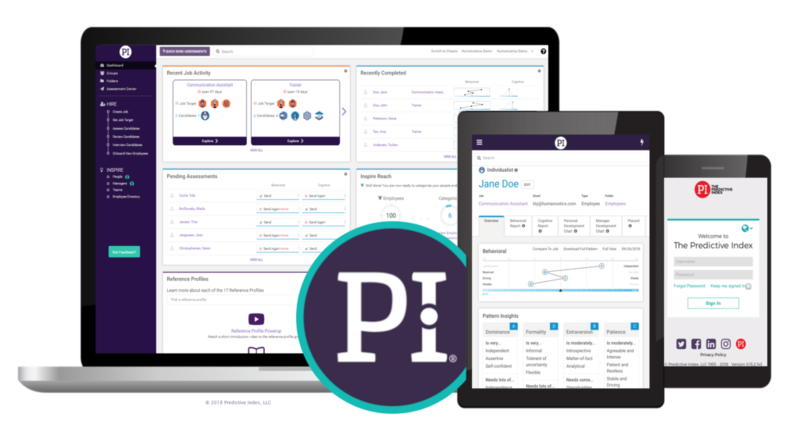 Learn how PI® gives you the workforce assessment tools you need to optimize the potential of your organization. Do you have a solution in place to successfully hire, retain and motivate your workforce? We help you make the right people decisions from hiring to retiring and thereby enable you to reach your business goals. We offer customized solutions no matter the size of your business. Predictio help businesses of all sizes, from small local companies to large multinationals with global reach. Predictio’s solutions are also widely used by municipalities and organizations. PI is an essential part of our recruitment process. The last few years we have also discovered the other possibilities PI provides us with when it comes to teambuilding activities, setting up project management teams and as a support for our development talks. PI as a tool is very helpful to work with managers and their teams. PI as a recruitment tool is necessary! PI helps us ensure the quality of our internal processes: recruitment process, appraisals, professional development and team development. We use PI in different ways in our organization. It is used as an additional step in our recruitment process. After the first interview we ask candidates who proceed in the recruitment process to conduct a PI test, we then use the result as a basis for questions in the second interview. We look at the candidate’s strengths and motivational factors linked to our competence requirements for the professional role. PI is never used as a factor for rejecting a candidate. The interesting factor is the dialogue regarding how the candidate manages challenges at the workplace where his or her basic strengths and motivation is not enough. I have thought about contacting you for a long time with some positive feedback, now I finally managed to do so! It is fun to have the chance to work with PI. Everyone who has received feedback from me have been positively surprised, because of how well the analysis matches their behaviour and how professional it is. It feels good to have the possibility to work with a tool that I can stand behind 100%, it is both useful and trustworthy. Predictive Index is being used more and more extensively within Atlas Copco internationally, as we gain experience and see how it strengthens our ability to enhance business results via an improved understanding of people's underlying motivation factors. A great certification training that gave me valuable insights, tools and ideas that I can start using and implementing directly. Knowing who you work with is extremely valuable. And giving managers the possibility to understand their co-workers is an added value for the company! PI is the right instrument for us in relation to recruitment and team development. We use PI within the PMC Group as a complement for discussions in all our recruitments. PI’s advantage is that it is quick and gives this extra input we need to confirm our view of the candidate at the interview. As an experienced PI analyst you can also give the candidate immediate feedback which is easy to relate to both for the candidates and the manager. We also use PI for team development where we look at the teams overall PI and the teams strengths and weaknesses as a whole. We also work with each specific persons PI in order to identify where there are potentials for conflicts or for optimizing each team members strengths to get a better effect of the entire group. PI is a naturally integrated part of my work day. My PI skills help me successfully adapt my oral as well as written communication. This has reduced misunderstandings to a minimum and helped me find ”short cuts” in my communication with my store managers and sales people. "We work closely in small groups, therefore the team composition is very important. I would even venture to say that the store managers' understanding of our employees’ motivational drives is their most important asset. In connection with recruitment interviews and development reviews, PI provides us with data that enable us to go beyond our gut feeling." Daniel was "Manager of the Year 2014" in the region Dalarna in Sweden. SVT has been using Predictive Index in almost all manager recruitments for over 10 years. PI has become a natural and recognized complement to the interviews for us in HR. We also use PI in team / group development. With PI the group gets a clearer picture of participants' motivations, strengths and development areas. SVT has about ten PI analysts today and they are all very much in demand. It's both fun and stimulating that the tool has had such a high impact in our organisation.